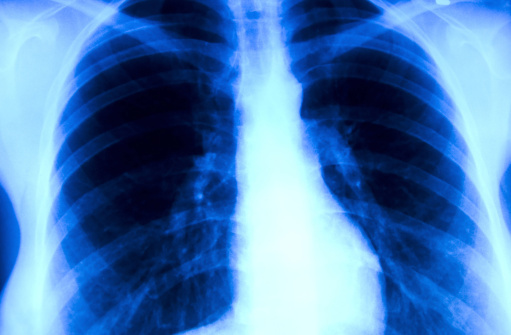 Researchers are investigating durvalumab as a first-line therapy for stage III NSCLC. Durvalumab — a PD-L1 inhibitor — met its primary endpoint of progression-free survival (PFS) in the treatment of stage III non–small cell lung cancer (NSCLC), according to an interim analysis of the phase 3 PACIFIC trial (ClinicalTrials.gov Identifier: NCT02125461). Durvalumab is already approved for the treatment of advanced bladder cancer, and is also being evaluated for the first-line treatment of NSCLC as monotherapy and in combination with the anti-CTLA-4 inhibitor, tremelimumab. The multicenter, double-blinded, phase 3 PACIFIC trial randomly assigned patients with locally-advanced, unresectable, stage III NSCLC who had not progressed during platinum-based chemotherapy concurrent with radiotherapy to receive sequential treatment with durvalumab or placebo. The primary endpoint of PACIFIC is PFS and overall survival (OS). The secondary endpoints include landmark PFS and OS, objective response rate, and duration of response. The interim analysis found that PFS was significantly prolonged by blinded independent central review compared with placebo. OS will be assessed as specified by the trial’s protocol. The initial results are expected to be presented at an upcoming medical meeting. Imfinzi significantly reduces the risk of disease worsening or death in the phase III PACIFIC trial for stage III unresectable lung cancer [news release]. AstraZeneca. https://www.astrazeneca.com/media-centre/press-releases/2017/imfinzi-significantly-reduces-the-risk-of-disease-worsening-or-death-in-the-phase-iii-pacific-trial-for-stage-iii-unresectable-lung-cancer-12052017.html. Published May 12, 2017. Accessed May 14, 2017.